Last week, MIT announced a new $200 fee as part of the regular yearly tuition increase. While students will now be specifically contributing toward their own activities, they will also be footing the bill for the annual operating expenses of the Zesiger Sports and Fitness Center. Dean for Student Life Larry G. Benedict has approved a proposal to ease the financial burden for fraternities, sororities, and independent living groups transitioning to the new residential system this fall. Members of MIT’s two unhoused sororities may be living together as early as next fall in a graduate dormitory as a solution to next year’s anticipated housing crunch. Germeshausen Professor of Chemical and Biomedical Engineering Robert S. Langer ScD ’74 was awarded the Charles Stark Draper Prize at a ceremony in Washington, D.C. on Tuesday. 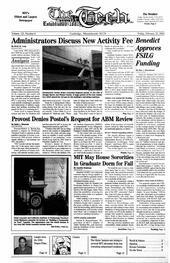 Palmer and Dodge, the firm representing MIT in the lawsuit by the family of Elizabeth H. Shin ’02, is expected to respond today to a motion by the family’s lawyers which seeks to disqualify the firm from representing MIT students who have been subpoenaed to testify in the case. Sexual Harassment From a Party Poster? The Russian Women’s Ice Hockey team took fifth place at the winter games in Salt Lake City with a 5-0 shutout against Germany on Tuesday.